Focus every aspect of prospecting and deal management on rep productivity. From eliminating arduous data entry to giving reps the cues that help them engage buyers and move deals forward, give your reps everything they need to close more deals without leaving Salesforce. Akoonu for Prospecting gets you ahead of next quarter by tracking and managing your pre-pipeline natively in Salesforce. SDRs and Reps use Pre-Opportunities to get on the same page and step up the quality of discovery, qualification and lead handoffs so you never miss a deal. Take the drudgery out of managing opportunities in a visual, easy-to-use interface native in Salesforce. The fastest and most intuitive way to see deal progress and monitor buyer engagement while keeping your sales process top of mind. No more frustrating Q&A with reps. Turn Pipeline and Deal Reviews into productive strategy and action planning. And do it with less administrative prep and follow up time for both reps and managers. Say goodbye to clunky spreadsheets and external tools, and build your forecast rollups from bottom to top in Salesforce. Start with snapshots of current opportunities and apply management judgement based on deal status at each level. 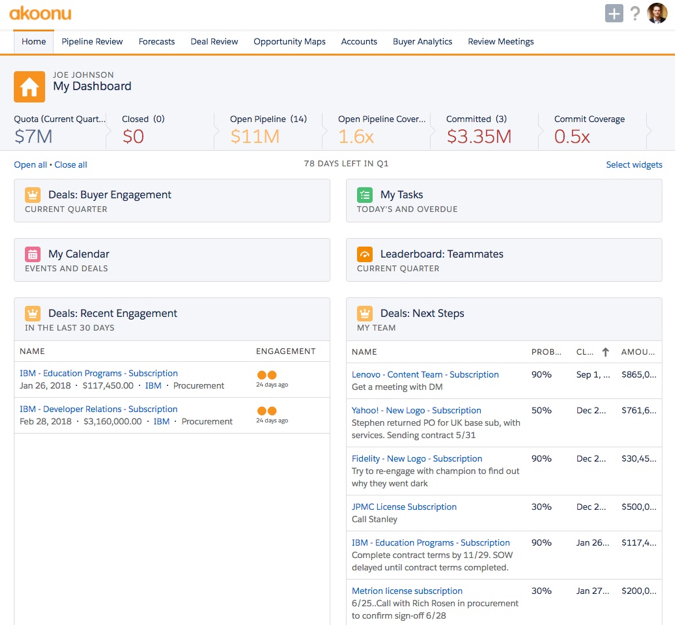 See for yourself how Akoonu strengthens Sales execution.